After the selection committee accepted a few of my submissions to Red Hat Summit 2016, it is now clear that the schedule has been finalized and I wanted to provide an overview of where you can find me the week of 27 June, in San Francisco. Throughout the week you will find me at the Red Hat Solutions pod, which is a demo station specializing on the Red Hat Cloud Suite. You will be able to see the demonstrations around four use cases specific to that product and an overview slide show. So what else is going on there? 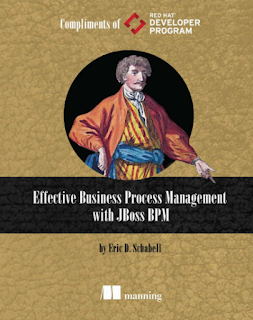 At the booth for JBoss BPM Suite they will be giving away postcards with fee codes for the Early Access Program for my upcoming book entitled Effective Business Process Management with JBoss BPM. Find me if you are interested in chatting about the book or have any input for my writing project. I am excited to be speaking again at Red Hat Summit and hope to see you in San Francisco.